Coffee from your favourite cup, anywhere and anytime up to 6 hours after you (or your barista) pour it! 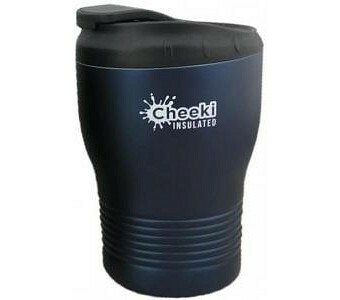 Cheeki’s 240-mL stainless steel cup fits in your vehicle’s cup holders and under coffee shop machines, so it’s easy to take it with you and top it off on the road. The double-walled vacuum insulation keeps the temperature right and the outside cool to the touch, and the BPA-free, dishwasher-safe flip-up lid stops spills in stop-and-go traffic. The unlined premium 304 (18/8) steel cup is attractively coloured with nontoxic ocean-blue ink and will last for years.